Eye on the Y: Will Gary Andersen raid BYU’s staff in his second go-round at Utah State? 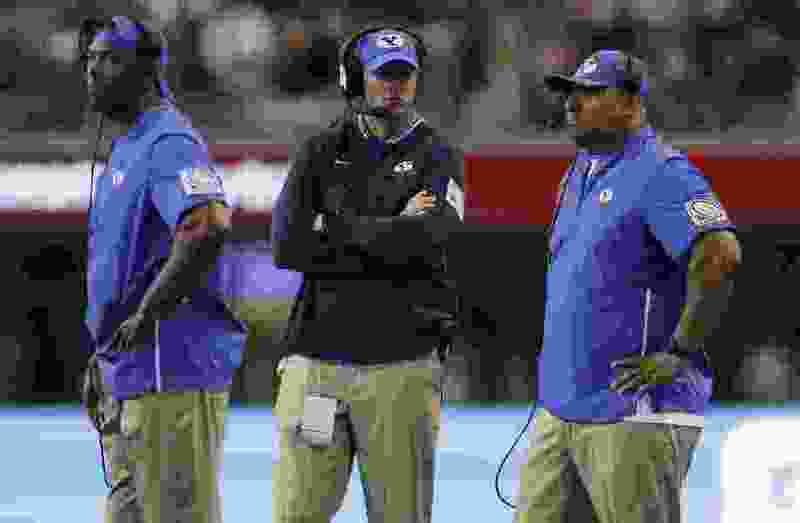 BYU head coach Kalani Sitake (right) discusses strategy with assistant head coach Ed Lamb (middle) and cornerbacks coach Jernaro Gilford (left) during a recent game. Sitake could lose a coach or two to Utah State, which has hired Gary Andersen to replace Matt Wells. Provo • BYU football coach Kalani Sitake told me last week that he expects his coaching staff to stay intact this offseason. But that was before current Utah assistant and former Wisconsin, Oregon State and USU coach Gary Andersen landed the Utah State job for the second time. Andersen is replacing Texas Tech-bound Matt Wells, the coach who replaced him. Of course, Andersen has ties to several BYU coaches, most notably Sitake, defensive coordinator Ilaisa Tuiaki, passing game coordinator Aaron Roderick and assistant head coach Ed Lamb from his time at Utah and Southern Utah. Wednesday, I asked Roderick if he has any interest in joining Andersen up north — perhaps as USU’s new offensive coordinator. Lamb and Sitake were out recruiting during Wednesday’s practice and post-practice interview sessions and not available for comment. However, Sitake said Monday that he has talked to Andersen recently and was excited that his longtime friend and coaching mentor is leading a program again. BYU’s bowl game against Western Michigan on Dec. 21 in Boise will determine whether the Cougars (6-6) finish the season with a winning or losing record, but Sitake said he’s not worried about that. • Is BYU a volleyball school? It certainly is now, with the Cougar women’s volleyball team playing in the NCAA tournament’s Final Four. First serve against No. 1 Stanford is at 5 p.m. and the match will be televised by ESPN. Wednesday, senior outside hitter Roni Jones-Perry was named a First-Team All-American and middle blocker Heather Gneiting was named National Freshman of the Year by the American Volleyball Coaches Association. Setter Lyndie Haddock-Eppich, libero Mary Lake, outside hitter McKenna Miller and middle blocker Kennedy Eschenberg also received All-America recognition. • BYU owns a large lead in the West Coast Commissioner’s Cup standings at the conclusion of the fall sports seasons. The Cougars won league titles in men’s and women’s cross country, women’s soccer and women’s volleyball. BYU has 40.0 Cup points; 2nd-place Portland has 31.5. • BYU’s women’s basketball team gave undefeated Utah a good game last Saturday at the Huntsman Center, but faltered in the second half and fell to 6-3 on the season. The Cougars host former MWC foe Colorado State (4-4) on Saturday at 2 p.m. at the Marriott Center. BYUtv will televise the contest.